Call it the ultimate whirlwind experience in the rocket business. In the span of 12 hours, Lockheed Martin's Atlas 5 rocket went to the launch pad, took on its fuel, persevered through a couple of technical bugs, roared off the planet on 31 million horsepower and was rewarded with another success as it deployed a commercial satellite cargo into orbit. The next-generation booster operates like no other at Cape Canaveral. It is assembled atop a mobile launching platform inside a 30-story hangar and then rolled to its spartan pad at Complex 41 that features no service gantry like conventional launch sites. Lockheed Martin calls it the "clean pad" approach of working on the rocket within the confines of a building and keeping the vehicle's stay on the pad to a bare minimum. 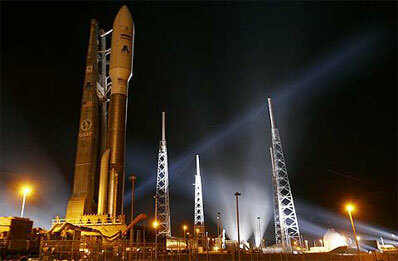 The launch team orchestrated a rare overnight Atlas countdown as the platform and ground systems were hooked together, the rocket powered up and tested and its stages fueled with kerosene propellant and cryogenic liquid oxygen and liquid hydrogen. 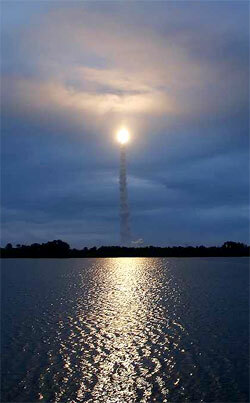 Launch was targeted to go at 4:41 a.m. EST (0941 GMT). But work fell behind schedule, prompting mission managers to reset the liftoff time later in the day's available two-hour, 40-minute launch period. Clocks were inside three minutes to launch when a faulty indicator gave an errant reading on the first stage liquid oxygen fill and drain valve's positioning. The glitch was solved and the countdown recycled, culminating with a sunrise liftoff at 7:07 a.m. EST (1207 GMT) this morning. But low-hanging clouds pestering the Space Coast spoiled what was sure to be a beautiful morning ascent as the rocket rose into the sky on the bone-shaking roar from its million-pound-thrust main engine and a pair of powerful strap-on solid-fuel boosters. The rocket disappeared from spectators' view less than a half-minute into flight. Downrange tracking cameras were more fortunate, spotting the rocket in time to see the exhausted 67-foot long solid rocket booster peel away and tumble toward the Atlantic, and later the nose cone being jettisoned and even the first stage shutting down and separating from the Centaur upper stage. The Centaur performed two firings during the launch, separated by a 90-minute coast over Africa, the Indian Ocean and northern Australia. To take full advantage of the rocket's performance, mission planners devised a trajectory to reach a higher-than-usual initial orbit, which meant the rocket had longer to coast to reach that orbit's high point before restarting its engine to inject the 9,000-pound AMERICOM 16 payload into a geosynchronous transfer orbit featuring a higher perigee and lower inclination than typical. In simpler terms, that rocket science means the satellite will have less ground to cover during its upcoming engine firings to reach a circular geostationary orbit 22,300 miles above the planet. Saving the craft's precious fuel supply means longer service life, perhaps upwards of 20 years, officials said. An hour and 49 minutes after liftoff, the Centaur stage released AMERICOM 16 to complete the 74th consecutive successful launch by Atlas rockets since 1993. It was the third AMC craft launched on Atlas this year for leading satellite operator SES AMERICOM of Princeton, New Jersey. "'Free at last' I said when separation occurred, and indeed the credit goes to all of you," Ted Gavrilis, president of satellite-builder Lockheed Martin Commercial Space Systems, told the launch team in post-flight remarks. "My message to you is you all go home and get a good day's sleep. You've been up all night for all of us and we really appreciate the hard work," added Andreas Georghiou, SES AMERICOM's senior vice president of business operations. AMC 16's power-generating solar wings and two communication antennas are expected to be deployed in about 10 days. The craft should reach geostationary orbit in a couple of weeks to undergo testing at the orbital location of 82 degrees West longitude over the equator. More tests are planned later at 85 degrees. 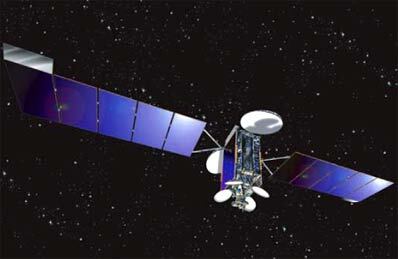 SES AMERICOM said the satellite should be ready to enter service in about two months. The primary user of AMC 16 will be EchoStar's DISH Network direct-to-home entertainment service, which has millions of subscribers across the U.S. The deal to use AMC 16 for direct broadcasting is part of the SES venture dubbed AMERICOM2Home. Built by Lockheed Martin using the A2100AX model design, AMC 16 features 12 Ka-band spot beams and 24 Ku-band transponders for broadband communications and television relay services to small roof-top satellite dishes. "It is a very powerful spacecraft that will meet a number of business needs for both AMERICOM and its customer EchoStar," said Mark Pasquale, vice president of commercial and government programs at LMCSS. "With the successful launch of AMC 16, in combination with its soon-to-be-operating identical twin, AMC 15, I believe the AMERICOM2Home concept has been fully realized and AMERICOM's excellence is clearly demonstrated once again," said Anders Johnson, SES AMERICOM's senior vice president of strategic satellite initiatives. For the Atlas program, its consecutive success string now equals the mark set by Europe's Ariane 4 rocket, which retired from service last year. 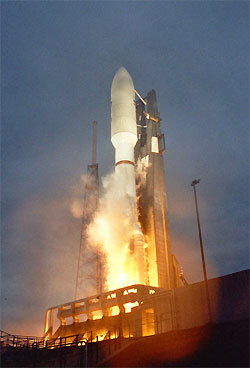 The Atlas feat includes launches of the Atlas 1, 2, 3 and 5 models. "I'd like to welcome the new world champion in launch vehicle reliability, which is the Atlas launch vehicle," said Mark Albrecht, president of Atlas and Russian Proton rocket marketer International Launch Services. ILS had 10 flights in 2004 between its two rocket families. "To be where we are today does not happen by accident. It happens because of the dedication and integrity of the people who work on the program," said Atlas launch director Adrian Laffitte. "When we say mission success is first, mission success is first. It's ingrained in us. It's part of our culture. To me, that's what the record is implying. It's not whether we beat the Ariane or not. It's the fact that we take each launch one at a time. But we also are very proud of the people who work on the program because that is their No. 1 priority." The next launch for Lockheed Martin will be the sixth and final flight for the Atlas 3 rocket fleet when a classified National Reconnaissance Office payload is hauled to space on January 27 from the Cape. 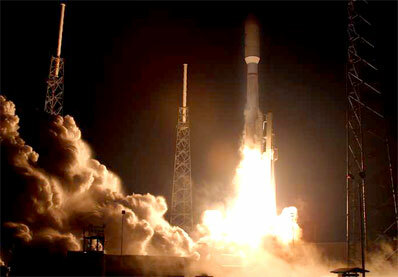 The next Atlas 5 is targeted for March 10 carrying the commercial INMARSAT mobile communications satellite.